Israeli investigations when conducted virtually always whitewash high crimes. Around 550 children were murdered in cold blood – two-thirds under age 12, another 3,400 injured, over 1,000 maimed for life. One of the deadliest episodes of the war followed, lasting four days, massacring over 200 civilians, countless others injured, hundreds of Palestinian homes and other civilian structures destroyed or heavily damaged – war crimes by any standard. According to Israel’s military, over 2,000 bombs, missiles, rockets, and artillery shells were fired on Rafah, around 1,000 during a three-hour August 1 time frame – intense hellfire largely against civilians. Overwhelming evidence showed Israeli forces attacked Rafah with disproportionate, indiscriminate ferocity – targeting civilians in their homes, others fleeing for safety, and anything seen moving. What happened was savage revenge attacks for capturing an IDF soldier, collectively punishing the entire population of Rafah – flagrantly violating the UN Charter, Fourth Geneva, and other international law. No criminal or other proceedings will be pursued against anyone involved in what happened – case closed, the way Israel always absolves its forces of indisputable war crimes. 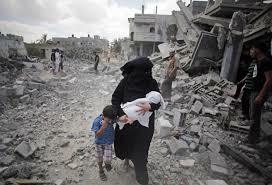 The August 1 – 4, 2014 Rafah massacre was carried out under Israel’s so-called Hannibal Directive. It’s been official Israeli policy since 1986 – kept secret for many years. Stephen Lendman is a Research Associate of the Centre for Research on Globalization (CRG). He can be reached at [email protected]. Featured image is from Amnesty International Ireland.